Before reading this chapter, answer or share with friends: What does sacrifice mean to you? How was Jesus’ death a sacrifice? This is a difficult area to understand, principally because in our culture animal sacrifice is not part of our way of life. For many, the word conjures up an image of primitive tribes slaughtering animals and even children and adults in an attempt to appease the anger of the gods to stop a pestilence or plead for rain. But this is only one of many meanings of the word. Let your Spirit come upon these gifts to make them holy. The bread and wine are ‘sacrificed’, that is, they have become holy by being given the identity of Christ who died and rose again. One thing must be made very clear. The historical cause, of Jesus’ death was that the rulers of Israel were so angry with Jesus they had him put to death because he was a threat to their authority – he had rebuked them many times for their failure to care for the people and for their hypocrisy. Jesus was not put to death by the priests in sacrifice in the way they would have sacrificed bulls or goats as part of their temple worship. They put him to death to get him out of the way. It was a political execution. When we speak of Jesus’ death as a sacrifice we are using sacrifice as a metaphor – a metaphor with very important theological implications. The metaphor then overflows into our understanding of the Eucharist. After Jesus’ death the communities, and in particular Saint Paul, reflecting on Jesus’ death and resurrection, could see there were many implications about the event that were not obvious at the time it happened. In other words they began theologising about Jesus’ death and resurrection, and broader dimensions were being discovered as communities reflected on this event that was so unique in the history of humankind. Through their reflections and discussions they ‘discovered’ that Jesus’ death could be described as a sacrifice. This word then came to be applied to the Eucharist. The offering of sacrifices in the temple was routine with the Jewish people, and as the first Christians were Jews they were influenced by their heritage when it came to discussing Jesus’ death. Let us look at some of this heritage. Three kinds of sacrifice were offered in the Old Testament: holocaust, communion and reparation. In a holocaust sacrifice a male animal was totally burned, the smoke rising up symbolising this sacrifice was being offered to God. The one who was offering laid his hand on the head of the victim to indicate that he was making the offering. The animal was slaughtered by the priests and its blood was poured onto the ground or on the edges of the altar.
. . . that you accept and bless these gifts, these offerings, these holy and unblemished sacrifices . . . If you wanted a sacrifice as a peace offering, to give thanks, to petition God or to establish relationships, then a communion sacrifice was what you offered. For a communion sacrifice either a male or a female animal could be used but it was only partially burned. The blood and the fat, considered the choicest parts, were offered to God while the rest was divided between the offerer and the priest. The communion sacrifice included a religious meal and this feeling of eating with God provided a sense of union or ‘communion’ with God. Behold the Lamb of God, behold him who takes away the sins of the world. Blessed are those who are called to the supper of the Lamb. In the early Church the Eucharist was sometimes called ‘The Lord’s Supper’ because it was understood that Christ the Lord was the invisible host who invited the participants to join him around the table. The letter to the Hebrews shows how this concept is applied to Christ and how he is the ultimate reparation sacrifice, replacing all the animal sacrifices of previous times. This is a long, rather dense passage which may need to be read several times and reflected upon to get the full depth of meaning. This passage makes it very clear that the sacrifice that Jesus made by his death has now replaced all the animal sacrifices that were regularly offered in earlier times. Luke supports the idea that Jesus’ death ended the old way of the sacrifice of reparation saying that when Jesus died ‘the curtain of the temple was torn in two’, (Luke 23:45) that is, the Holy Place no longer had to be curtained off – it no longer existed. In the Eucharistic prayer the story of the Last Supper says that Jesus’ blood was shed ‘for the forgiveness of sins’. Reparation for sin is no longer carried out by the blood of animals ‘again and again’ in a temple ritual but has been carried out ‘once for all’ by the blood that Christ shed from the cross. In the Eucharist we remember this event that happened on Good Friday and bring it into the present through the ritual of the Mass. As I said in Chapter 9, when you buy a weekly train or bus ticket, you ‘validate’ it on each journey. 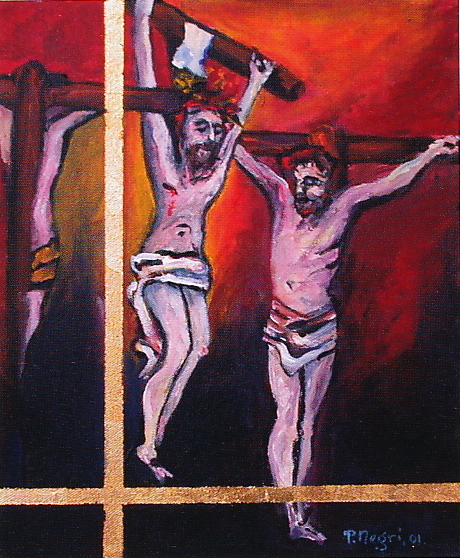 Jesus’ sacrifice of himself on the cross happened 2000 years ago; that was when he ‘paid the price’. The Eucharist ‘validates’ Jesus’ sacrifice of himself making it available to us each time we participate at Mass. At the Eucharist we don’t eat the meat of slaughtered animals; we eat ‘the Lamb of God who takes away the sins of the world’ in the form of bread and wine. Christ’s sacrifice was offered only once but is validated, brought into our own moment, when we participate in the Eucharist. In LITE II, Bob Rousseau says the Eucharist is the “sacramental actualization” of Christ’s sacrifice. After the considerations of Paul and the other New Testament writers, theologians in the second century had to explain why Christians did not offer animal sacrifice as adherents of other religions did. They suggested that instead of animal sacrifices, a genuine sacrifice consists of a good soul, a pure mind, prayers and thanksgiving. This explanation amounts to a spiritualisation of the idea of sacrifice. It formed a continuity with an idea that had been developing among the Jews for about 200 years before Christ, namely, that animal sacrifices were inadequate and a holy life was what God really wanted.
. . . you never cease to gather a people to yourself, so that from the rising of the sun to its setting a pure sacrifice may be offered to your name. The absence of animal sacrifice was a notable difference between Christians and other citizens of the Roman Empire and increased the incentive to see the Eucharist as the sacrifice unique to Christians and a perfect sacrifice at that. Another dynamic was that there were people being baptised for whom the sacrifice of animals had been a regular event and they missed this part of their worship life. For these new Christians, the ‘sacrifice’ of Jesus replaced animal sacrifices. All these discussions brought to light the value of the Eucharist as sacrifice and by the fifth century the word became accepted as normal in the vocabulary. From becoming a standard term it gradually became the only term used to describe the action of the Mass, and some teachings and practices of the Church suggested that Christ was being offered in sacrifice every time the Eucharist was celebrated. The Protestants in the sixteenth century were justified in revolting against this idea and much of the hostility between Catholics and Protestants on this matter continued until well into the twentieth century, as I can recall very clearly. In those years sacrifice was the dominant theme in church teaching about the Eucharist which was referred to almost exclusively as ‘the holy sacrifice of the Mass’. Today we have rediscovered many of the subtle meanings of sacrifice. We all recognize heroic sacrifice and applaud it when it appears. In Australia, Anzac Day is always an occasion for speeches about the sacrifices that our armed services personnel made when they signed up for military duty. The men who toiled for two weeks underground to rescue two miners trapped by a rock fall at Beaconsfield, Tasmania, in May 2006, made the sacrifice of enormous time and energy and put their own lives at very serious risk. In daily life, parents sacrifice a great deal of their time to bring up their children in the best possible way. People wanting to get a degree sacrifice much of their ‘fun time’ doing their assignments. Those wanting to get into the Olympic games have no alternative but to make many sacrifices. For Christians, the ‘material thing’ is the bread and wine ‘which earth has given and human hands have made’ and which is ‘sacrificed’, that is, made holy through the ritual of the Eucharist. Thus we communicate with God and God with us through Christ who gave his life freely out of love for us.